Miss Llwyd has just returned from an international conference in Turkey organised by the European Union’s Comenius scheme. During the conference, she had the opportunity to meet teachers from 14 other European countries, as well as attending seminars on digital learning and multilingualism. The conference’s main aim was to find partner schools from all over Europe in order to apply to form a project which will give pupils from each country the opportunity to communicate regularly in various ways. If the application is successful, Ysgol Gymraeg will cooperate with schools from Denmark, Finland, Ireland, Turkey and Italy. Whilst in Turkey, Miss Llwyd visited a school for pupils between 6 and 16 years old in the city of Alanya in the south of the country. On the 22nd of November nearly three hundred children from Year 1-6 went to Theatr y Werin at the Arts Centre to watch the annual pantomime. We were treated to some excellent dancing and acting, as well as some excellent songs! Everyone thoroughly enjoyed the character 'Idishido', and were glad that everything turned out well in the end, with everyone - the good guys and the bad guys - becoming good friends! Phew! At Pets at Home, we had a lot of fun looking at all the animals that were there. We saw lots of colourful fish, rabbits, guinea pigs, mice and we even saw a large lizard as well. We also looked at various pet foods and different toys to entertain pets. It was then time to leave and walk back to school, which was just as much fun as we had to walk past all the rides of the funfair! "Today on Children In Need Day everyone came to the school in wonderful fancy dress! We all contributed £1 for dressing up, and it was our turn as Year 6 pupils to organise games and stalls in the hall for the whole school. Everyone enjoyed the various activities on offer, from naming the teddy to guessing places from photgraphs. There were many delicious cakes on sale as well! Thank you all for enjoying spending your pocket money!" Congratulations to three pupils who were successful in this year's FfotAber competition. Brooklyn came 2nd with his fantastic photograph of waves crashing against the promenade, with Mali and Mari being highly commended for their photographs. Very well done the three of you! 2nd - Madeleine Grice Woods - Back..
P.T.A BOOK FAIR RAISES £668! "The evening proved to be successful yet again this year. Seeing so many people supporting the various activities with such enthusiasm is wonderful. I'm very grateful for everyone's support, especially the members of the PTA for organising and making sure everything ran smoothly on the night. It is much appreciated." 124 BACKPACKS ARE ON THEIR WAY TO KENYA! What happens to the backpacks now? and learn more about the project. "Walking into this morning's assembly was very different as the hall was full of bags! During the past few weeks we have been collecting items to put in the backpacks such as excercise books, pencil cases, crayons, clothes, soap, toothbrushes and toothpase, towels etc. This morning 124 bags were ready to start on their journey to Kenya. Everyone at the school is very happy that we have managed to collect so many backpacks, as they are sure to put a smile on many children's faces between now and Christmas." "Today Thea from ‘Prism’ held a workshop with class 6Ll throughout the day. ‘Prism’ is a specialist alcohol and drugs service for young people, and the purpose of the workshop was to teach us about the dangers of alcohol, drugs and substances. We did a lot of discussion work during the day and quite a bit of practical work too. It was interesting and very important to hear about the negative effect of alcohol, drugs and substances such as solvents on young people and adults. At the end of the day, we had a chance to wear ‘beer goggles’ to see what effect drinking too much alcohol has on people. 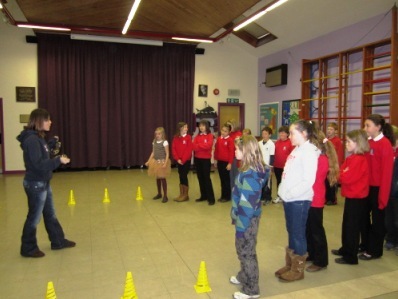 We had to try to walk around cones without knocking into them – a very difficult task!"